Creatives gravitate to a showy New York hotel lobby to work hard and look good doing so. On a sticky summer day in New York, I walk east on 29th Street. My destination: the Ace Hotel. As I pass the expansive windows of the John Dory–the mod oyster bar that’s part of Ace’s ecosystem–I notice Norah Jones at a window table, having lunch. This is the place. The bellboy on duty, who looks exactly like Keanu Reeves (circa Point Break), opens the hotel’s weighty double doors, and I enter the cavernous but intimate lobby and find a seat. To my left, several well-coiffed thirty-somethings, speaking Italian, assemble camera equipment. 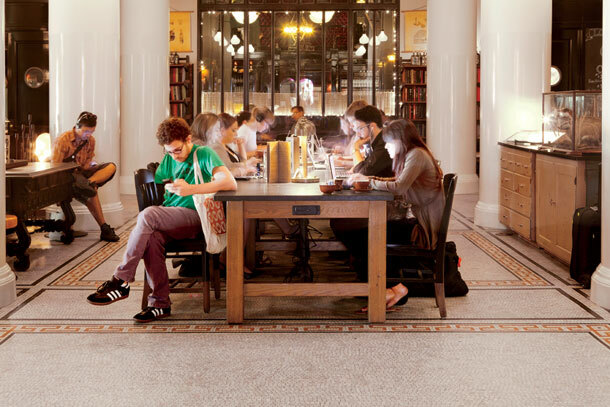 To my right, at the long wood table outfitted with vintage library-carrel lamps, sit an array of people, earbuds in place, eyes glued to laptop screens. An intense young guy with the veiny hands of a strongman appears to be playing Japanese video games. Another dude logs on to the North Carolina Medical Board’s website. At the dining table across the way, a gaggle of boisterous young women in sweater sets make calls and assemble mysterious packets from boxes of photocopies. Who are all these people and what are they doing here all day? 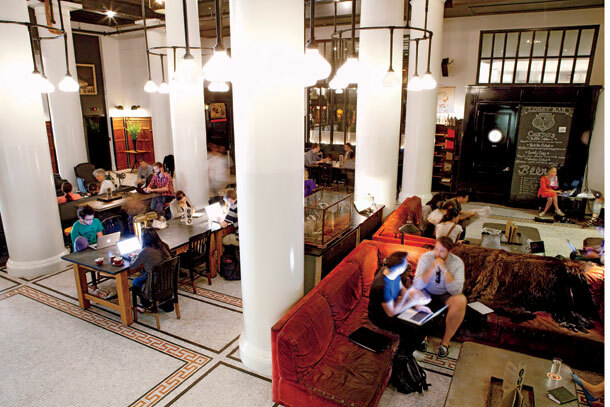 The city’s other communal spots tend to be all work (chains like Starbucks) or all play (hip downtown cafes); the Ace is both. “People are getting a lot of work done here,” says Shawndra (who prefers her last name not be used), one of several women working at the table on the eastern side of the lobby, from which they run NYC Clean Team, a luxury cleaning service. Back at the main communal table, an androgynous girl with the delicate complexion of someone who rarely sees the sun gets up to leave. “I’m a biomedical informatics professor,” she says. “I come here to do research and get away from the students.” As she packs up her stuff, a foxy mom in cropped acid-washed jeans and hoof like red-suede wedges strides through the lobby holding hands with her sundress-clad daughter. They are on their way to the in-house gift shop/boutique, run by the people behind fashion mecca Opening Ceremony and a travel specialty shop called No. 8a, where you can buy, among other things, Marvis toothpaste and the Criterion Collection edition of Tout Va Bien. It’s hard to say who came to the Ace first, the beautiful people or the creative cool kids. The New York outpost, the first East Coast location for the Portland, Oregon-based brand, nailed the proper tone immediately. The hotel had the right low-lit, casually arty look; the right vibe of easy exclusivity (no velvet rope required because no one unworthy would dare to enter); the right food (the Breslin, run by Spotted Pig gastro stars April Bloomfield and Ken Friedman, was the first eatery in the hotel); and the right scene. For a while, every after-party, celebrity-DJ gig, or fashion event seemed to be held here. This has all contributed to Ace achieving its signature balance between practicality and stylishness. “The environment here is more or less a spontaneous organism striving for homeostasis,” says Ace cofounder Alex Calderwood. sandwich spot. The other sits alone, a fluffy white dog in her lap. There’s a collective tension in the room: We’re here to work, but, seriously, are all of these nerd boys too chicken to talk to her? The question goes unanswered, thanks to the appearance of an even more compelling guest, a tall, serene man with a long gray beard, wearing a white turban and caftan, who sits directly across from me. He methodically consumes a chocolate doughnut followed by a chocolate croissant, then proceeds to clip coupons. “I’m an appellate lawyer,” he says, handing me his card, which lists his name as Hari Nam Singh Khalsa. “But I also travel around the world as a spiritual healer.” I ask him about the coupons. “I get these Costco things,” he says with a shrug. Behind him, in the lounge area, a couple leaves their suitcases with the bellgirl (an Alexa Chung doppelganger), claims a pair of arm-chairs, and orders margaritas. In addition to drinking tequila in the middle of the day, Terri Hinton and Will Rogers also run businesses. Hinton founded Evolutionary Connections, a brand management and development company, and Rogers runs Visual Sapien, a design firm. Based in San Francisco, they’re in town in part to attend a party for Gerard Senehi, who calls himself “the Experimentalist,” one of the world’s preeminent mind readers. “I was talking to this futurist last night who really freaked me out,” Rogers says, telling me about these neuroscientists he met who are doing research on free will. Their basic conclusion? “It doesn’t exist,” he reports. After downing their cocktails, the couple heads to the airport but leaves me with homework: investigate Moore’s law and the singularity. When they’re next in New York, we’ll rendezvous–at the Ace, of course–and get started changing the world.